Loafers Glory has one double bedroom with an en suite shower room, making it ideal for a couple. There is an open plan living area with newly fitted kitchen and sitting room, as well as a tastefully decorated conservatory. Centrally heated throughout. You have a choice of two outside seating barbecue areas, one has a parasol for protection from the sun, the other is under a weather proof pergola to enjoy all weather outside relaxation, with a hammock seat to kick back in. You are welcome to use our free Wi-Fi internet network with your own mobile device or the SMART HD TV. There is a good selection of books, novels, guides and maps available for your use including cookery books. The Krups Coffee maker has proved to be popular. After a day’s adventure, you will find Loafers Glory the perfect place to return to unwind with a cold drink in the garden or conservatory, or maybe cook with fresh herbs from the garden on a the barbecues, reflecting on your day and planning the next. The entrance to Loafers Glory is through the double doors of the Conservatory which is arranged as a Dining Room with bone china tea and dining service. On a fine day you can throw the doors open and eat al fresco under the pergola by the pond or by the figs and grape vine. 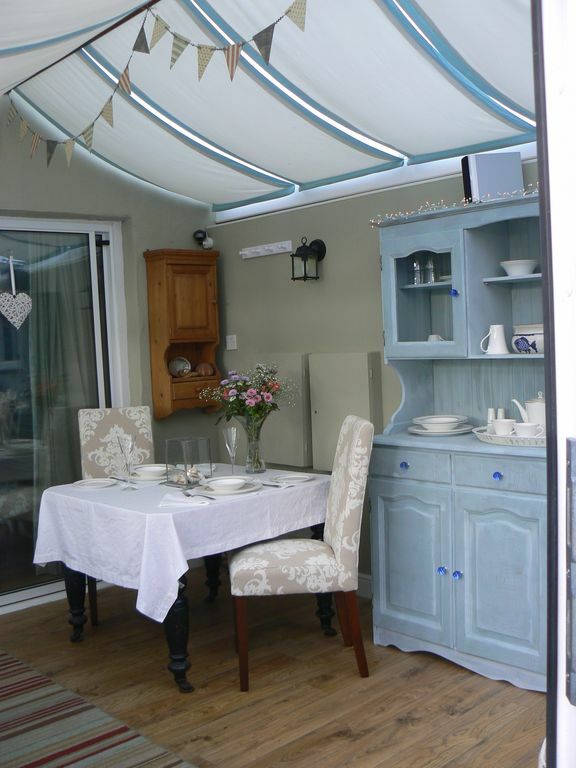 A large radiator, blinds, HIFI and sofa allow privacy, comfort and flexibility throughout the year in the conservatory. A romantic dining atmosphere overlooking the enclosed garden stocked with magnolia, hydrangea, roses and fuschia is quite special. We are fortunate to have an abundance of wildlife in this quiet spot which you can watch from the comfort of your 'home away'. The open plan oak floored lounge area is the perfect place to relax after the adventures of your day, with entertainment to ensure your holiday continues. There are two large leather sofa's for stretching out with Freeview SMART HD TV with Wi-Fi access and a neatly concealed Washer/Dryer. The newly refurbished, well-equipped country kitchen includes a coffee maker, microwave, electric cooker and hob, fridge and separate freezer providing occupants with the perfect basis to self-cater. The bedroom is tastefully decorated. The double bed is furnished with luxury quilt, pillows and bed linen. There is a dressing table mirror, hair dryer and wardrobe. Bath robes provided. The bright modern shower room offers attractive facilities (bath sheets provided) electric shower, towel rail/radiator and toilet. Secluded Garden with choice of outside dining patios, ample parking, central heating. Easy access to many varied public footpaths for some fine walking or cycling from the doorstep. Your hosts, Shelley and Peter have not looked back since moving to Treverva from the nearby Harbour town of Falmouth sixteen years ago. We have spent many years between us holidaying and living in Cornwall, working in Engineering, the Health Service, Education and Marine Industry. Previously from Leicester and Liverpool, a desire for a slower pace of life and chance to indulge in his hobbies of water sports led Peter to Cornwall, much as Shelley's parents some 35 years ago. We also enjoy travelling and recently extensively toured the UK staying in numerous Guest Houses and B&B's in search of our ancestors. We are still surprised to be finding new delightful areas in this part of Cornwall (beaches, creek-sides, villages and gardens), which we would be happy to share with you. The main barn was used as a headquarters by the local land army in the 2nd world war. Loafers Glory is named after the boat which Shelley's parents bought when realising their dream all those years ago. We have been lovingly modernising the property over the last 10 years and think we have managed to build a high quality holiday experience which we ourselves would be delighted to receive. Quiet, tastefully decorated, well equipped. We had a super restful time, Loafers Glory is a great spot for exploring Cornwall. Pete and Shelly were lovely hosts and have put a lot of thought into making the apartment welcoming. We appreciated the Saffron buns on arrival as well as the coffee pods and milk. They have lots of good local knowledge to share. Great place for exploring north and south shores of Cornwall. Loafers Glory was so lovely, All we needed and more, very comfortable. Pete and Shelley were lovely hosts ...very helpful with local information and reccomendations. Would definately recommend ! A lovely relaxing break. The property is very clean and cosy perfect for a couple. The owners were very friendly and welcoming. We would definitely visit again. We are so pleased that you were able to relax during your stay. We are always trying to improve our guests' experience. If you come again you will be able to use our new double car port which we will be completing this autumn. Many thanks for submitting a review. Although well equipt the accomodation was not as we had hoped. The bedroom was tiny and had no window that we could open. The bed was small and uncomfortable. The bathroom was very small and the towel rail did not work. This negative review is the first we have received in the 5 years we have been renting Loafers Glory. We are mostly disappointed that you were unable to speak to us about your issues, as most of the problems you have mentioned could have been remedied immediately. The master towel rail switch is outside the bathroom door, to comply with safety regulations. It is fully functional. There is a very large radiator in the conservatory which you could have utilised also. Similarly the window and blind opener is tucked next to the wardrobe with the ironing board. The homeaway website offers a comprehensive reflective guide to the property including dimensions. We believe the rental price is reflective of the size and location of the property. It is larger than most hotel suites, with the additional benefit of free parking, outside space and all self catering amenities and personal touches. We have friends and relatives critiquing the property regularly and stay there ourselves from time to time. We researched the mattress purchase carefully, it is of a very high industrial quality - it does not have memory foam; there are light and heavy pillows to choose from, an additional top quilt which you can opt to use. We ask all our guests not to hesitate to let us know if they need any help or advice. We were professional and courteous with your various email and telephone requests for directions prior to your visit. We cannot understand why you did not speak to us about the issues you indicate on your arrival. We have guests who return year after year. We hope you at least enjoyed some quiet time away from your visitors and your trip to the Tate during this short autumn visit to Cornwall. We hope our response is helpful. We stayed at Loafers Glory for a week the end of September. Were warmly greeted by Shelley and Peter and shown around. Lovely touch of flowers and some saffron buns together with some provisions in the fridge and cupboards. A lovely quiet position and as we were fortunate to have almost perfect weather we even managed to have afternoon tea in the garden most days. Very well equipped with everything you would need in your own home. As our first time staying in Cornwall we did some of the tourist visits (St Ives, St Michaels mount etc.) but as out of season was not too busy. We both also enjoyed Falmouth itself, along the beaches, the harbour and the town. Eventually ran out of time before we were able to see all the places on my 'list' so will hopefully return again. Would highly recommend staying. A great position for visiting lots of lovely places. Thank you Shelley and Peter for a lovely break. Thank for your kind words. So glad it worked out well for you both and you had a great introduction to Cornwall. We look forward to hosting you again should you wish to return. A peaceful tranquil retreat awaits you at Loafers Glory. Treverva is a small quiet hamlet nestled on the North Helford River, perfectly located to explore Cornwall's attractions with ease. Approached from a quiet road off the A39 in the grounds of Trewartha Barn, amidst rolling countryside, studded with ancient mines, hidden creeks and villages, the property is a perfect choice for those wishing to combine a rural and coastal holiday. It offers an idyllic “away from it all” setting that is also a perfect base for touring. Once you arrive in the private gated drive off the road, access to Loafers Glory is through the enclosed garden past the raised pond down two steps. Off road parking is also available. The Helford River is a magical waterway of hidden coves and creeks. A vast stretch of ancient woodland runs along its northern banks. The towns of Penryn, Falmouth and Helston are close by, where you will find shops and all the amenities you would expect. Tremough University Campus is a 15 minute cycle ride away along the country lane at the back of the reservoir. Lamanva Farm Store is half a mile up the road. They sell fresh organic bread, fruit, vegetables and local produce. Mabe stores and Post Office (with ATM) is less than 2 miles away, there is a large Asda Supermarket on the A39, 2.5 miles away in Penryn. A five minute walk from Loafers Glory leads you into a two mile circular walk around Argal Lake and Nature Reserve (approx 1 hour walk). It is noted for its wildlife and beauty, passing through woods and meadows, overlooked by the 15th century tower of the Church of St Laudus, Mabe. There are several picnic and barbecue areas and excellent views across the water. It also has a well stocked coarse fishery with permits available. There is a beach to suit your occasion or mood come rain or shine within easy reach, including some choice secluded spots away from the crowds such as Durgan and Woodlands in Mawnan Smith. The lively Gyllyngvase beach in Falmouth is over looked by the imposing Pendennis Castle with fantastic views of the Lizard Peninsula. The award winning Gylly Cafe is open throughout the year. This contemporary cafe serves breakfast, coffee, home-made cakes, tasty lunchtime treats or evening meals using local ingredients. They host live bands on a Sunday night. This coast is renowned for its beautiful gardens and there is plenty of choice on our doorstep with Trebah, Glendurgan and Penjerrick to name but a few. There is some super walking to be had with public footpaths in all directions right from the drive. Reference guides and maps are available for you. Lettings are generally Saturday to Saturday, arrival from 4pm, departure by 10am. Arranging payment for your holiday offline by bank transfer can be done by emailing me.